The iPhone Dev-Team has just released redsn0w 0.9.4 to jailbreak and unlock iPhone 2G, iPhone 3G (No unlock for 3G), iPod touch 1G and iPod touch 2G (older Non-MC models only). Do not update to iPhone 3.1.3 firmware yet if you want to preserve your unlock for iPhone 3GS, iPhone 3G, iPod touch 2G (new models) and iPod touch 3G. This is because the new iPhone 3.1.3 firmware updates baseband to 05.12.01 on iPhone 3GS and iPhone 3G which makes it impossible to jailbreak and unlock iPhone 3GS and 3G. Follow the simply step by step instructions below to jailbreak and unlock iPhone 2G, jailbreak iPod 1G/2G (older models only) on 3.1.3 firmware. You can also jailbreak iPhone 3G with redsn0w 0.9.4 but doing so will make you loose your unlock. Note: In this guide I have used redsn0w 0.9.4. 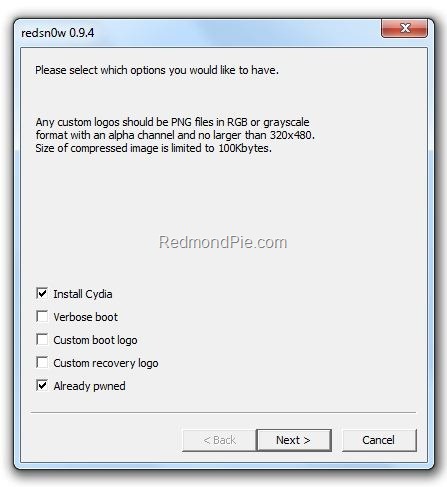 If this version gives you problem on iPhone 2G and iPod touch 1G, then try redsn0w 0.9.3. Download redsn0w 0.9.3 from here and then follow the instructions as follows. NOTE: The instructions posted here almost similar to the one we posted earlier with redsn0w 0.9.3 for iPhone 2G and iPod touch 1G/2G. The only difference here is that we are using the latest redsn0w 0.9.4 from Dev-Team which is specially released for this firmware update. Step 1: Update to original iPhone 3.1.3 firmware via iTunes. Downloading and installation instructions for iPhone 3.1.3 firmware can be found from here. Step 2: Start redsn0w 0.9.4 and point it to the respective original iPhone 3.1.2 firmware to proceed. Yes you need to point it to iPhone 3.1.2 instead of 3.1.3 because redsn0w 0.9.4 is still unable to validate the latest firmware. Step 3: Now select “Install Cydia”, “Unlock” and “Already pwned” options for iPhone 2G. Step 4: Now make sure your device is both OFF and PLUGGED IN to the computer before you click “Next”. 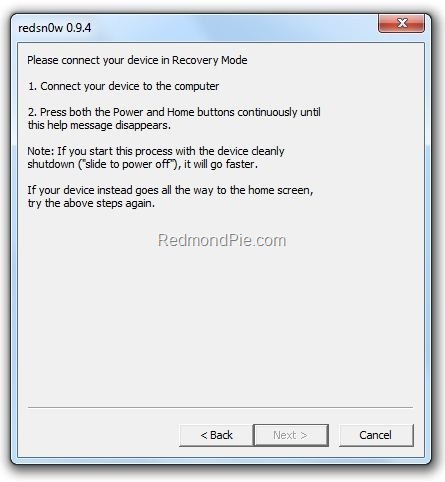 Step 5: Connect your device in recovery mode by pressing the Power and buttons continuously. Step 6: Sit back and enjoy while redsn0w will do all the rest for you. Once done, your iPhone 2G will restart automatically and you will find it jailbroken with iPhone firmware version 3.1.3. Step 7: Once you are done with the jailbreak, you can now unlock your iPhone 2G running jailbroken firmware 3.1.3 by using BootNeuter app from Cydia. Follow the instructions from Step 4 here to unlock iPhone 2G on 3.1.3 firmware. Note for iPhone 3G and 3GS Users: We strongly suggest that you stay away from this official upgrade until and unless the DevTeam or George Hotz releases new jailbreaking and unlocking tools for 3.1.3 firmware. We will let you know when it will happen. In the meantime you can follow our complete jailbreaking and unlocking guide for iPhone 3.1.2 firmware using blackra1n, PwnageTool, redsn0w, sn0wbreeze, ultrasn0w and blacksn0w. UPDATE 1: Sn0wbreeze 3.1.3 -V1.3 is LIVE! Follow the guide posted here to jailbreak iPhone 2G, 3G and iPhone 3GS (older bootrom only) on iPhone 3.1.3 firmware. iPhone 3G and 3GS can then be unlocked using ultrasn0w or blacksn0w. iPhone 2G can be unlocked using the guide posted here. UPDATE 3: Is GreenPois0n going to Jailbreak iPhone 3.2 and iPad Untethered? More info here. UPDATE 4: Geohot has a working solution for iPhone 3.1.3 / 3.2 on the new baseband and bootrom. Here is a video of it in action. UPDATE 5: iPhone OS 4 has been announced. Download iPhone OS 4 Beta Developers Preview for iPhone and iPod touch here. Jailbreak iPhone OS 4 Analysis can be found here. 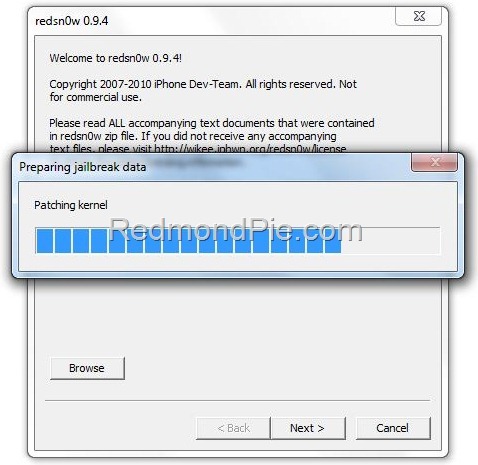 UPDATE 6: Jailbreak iPhone OS 4 with Redsn0w 0.9.5 is here. Step by step instructions can be found here. UPDATE 7: Unlock iPhone OS 4.0 for iPhone 3G with ultrasn0w is possible, provided that you have one of those rare 05.08 Bootloader 3G, whose baseband is downgradable to 04.26.08 from 05.13.03 using Fuzzyband. Step by step guide can be found here. UPDATE 8: Spirit Jailbreak tool has been Released. You can jailbreak all iDevices including iPhone 3G/3GS, iPod touch 2G/3G and iPad on OS 3.2. iPhone unlockers should stay away! it worked! thanks for everything. keep up the good work! are you using the most up to date version of iTunes? having the same problem…little help? i have a 2gen iphone and after redsn0w finishes the screen stays blank and does nuthing.. any thoughts of whats wrong?? Ye I noticed after a while. lol. Thanks though. I finally got 3.1.3 Jailbroken with Spirit, but iFunBox shows it as Jailed still. Cydia is installed but I have host and other errors. Do you know how I can put cracked and non apple approved apps on it. It's an MC Model but I think an old bootrom. MC132B/A SN: ***11******. Is that old or new? Thanks in advance. After Step 5 , Next button on that screen is never enabled. can somebody please tell me whats wrong. I'm on iPhone 2G 3.1.3 software …. what is the best way to jailbreak and unlock 3g 8g on 3.0 baseband 4.26? I have iphone 3Gs which is stuck at emergency call screen I tried to jailbreak it bu redsnow but i am not able to do so. Can anyone please help me. Works perfectly, on XP ! Vista fails miserably. Win7 has native quicktime support and doesn't want to run older iTunes, so this causes all kinds of issues. Restore to ipw 3.1.3 and then jailbreak or unlock it. Else, you can try the same procedure on another laptop or PC. while i'm jailbreaking nothing appears, redsnow says it's done and the rest will take place on my device however, i'm just looking a a blank screen i've held the buttons correctly so i don't really know what i'm doing wrong. In my case it helped, when I processed WITHOUT ticking the “Already pwned” tick box (iPhone 2G 3.1.3). Before I used to get a black screen instead. These instructions are totally incomplete: (1) The download links are hidden at the bottom of the article after a bunch of “updates”. (2) the 2G 3.1.3 ipsw is not recognized by the software despite statements that it works with 2G 3.1.3. (3) All the exhortations “use 3.1.2 ipsw” to overcome this problem ignore the strong wording of “point redsn0w to the ipsw for the version of firmare you have installed.” Is it ok that they are inconsistent (running 3.1.3 but pointing to a 3.1.2 ipsw). I don't know. (4) Proceeding thru redsn0w 0.9.4 with the 2G 3.1.2 ipsw brings up a request for boot loaders which are not mentioned in these instructions at all. These instructions are pretty disappointing for iPhone 2G users with iOS version 3.1.3. (4) Try to run Redsn0w 0.9.3 to make sure the IPSW file is found in PWNAGE Folder, then exit Redsw0n without going any farther. (6) Run the Redsn0w 0.9.3, and follow the instructions. I did update my IPhone 2G the 3.1.3 as procedure above. Worked great for me on 3G. Thanks for this. After all done… phone must restart it self… but it do not happen like that… just black screen .. over hours… why ? i updated my iphone 2g to 3.1.3 it was succesfully updated finally after restarted it under gone emergency mode i am ableto make and recieve calls but menu is not opening any body help what would i doooooooooo? Did you use your own sim card in it? I have the previous owners simcard which lets me use my 2g as am ipod. Should I jailbreak with my simcard or the previous owners. I need it activated so I can use the phone features. that was really great, i messed my phone in the beginning but it worked like a charms when done right. its awesome worked fine for me…………. Worked great to jailbreak my 3g on 3.1.3 with 05.12.01 baseband, however, anyone else run into a problem of missing MMS ability afterwards? 3.1.2 with blackra1n I had no such problem. Thanks. The Cydia app won’t download because I’m running it without a data plan. Any suggestions? There is a Cydia app MMS2G for this but it wouldn’t work.